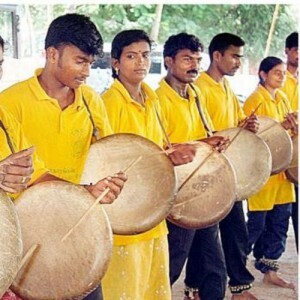 The thappu, thapu, dappu or parai drum is a frame drum of India. It consists of a circular wood frame with one end closed with cow skin membrane and the other end open. Thappu is played with two sticks, being one larger and thinner than the other one. It is performed in dances, funerals, temple festivals and sport events. Thappu drum or Parai drum is also played to invoke the deities at madras temples.